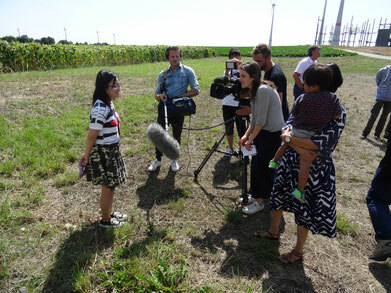 Atsumi Ai (foto from Aug. 2016 during a stay at juwi company in Wörrstadt, interviewed by a TV-team from SWR) came to Germany with the NPO EarthWalkers in 2016 along with its Senior Highschool Exchance Programm to study about energy shift in Germany, about renewable energy, about history, beside others. Her mother Ozeki Miki and Ai had moved from Fukushima Prefecture two years after "3.11" to Himeji area. Ai wrote her story in 2016. Her mother's experiences - printed also on this website (https://www.andreas-singler.de/fukushima-福島/stimmen-der-mütter-母達の声/) - are published in the last chapter of my book "Sayonara Atomkraft. Proteste in Japan nach 'Fukushima'" (EBVerlag Berlin 2018). I’m Ai Atsumi. I’m from Hyogo prefecture in Japan. I moved to Fukushima prefecture to Hyogo prefecture when I was 14 years old, because we felt worried about the Nuclear accident, so we decided to move to Hyogo Prefecture. I’m 16 years old now. It’s been since 3 years since I moved. I can’t believe it’s already been 3 years. It’s been 5 years since the great earthquake in the east of Japan. I live in Hyogo Prefecture now, so I won’t speak about the current state of Fukushima Prefecture, but I’m going to speak about my experience. I’ll now talk about my experience 3/11/2011. I was 11 years old. In a blink of an eye, my hometown had been hit by a major earthquake. When the earthquake occurred, I was still so young so I didn’t fully understand the effects of the earthquake. However, I gradually began to understand the terror of radioactivity which was a result of the meltdown of the nuclear power station. Just after the earthquake had occurred, I was told that even at school. I had to wear long sleeves, long pants, a hat and a mask. Even during summer, when it was hotter than 30 degrees, we had to wear long sleeves and pants. Also we were refrained from doing the pool activities, instead we had to stay inside, even if I was looking forward to it. There were even rules about a particular time we were allowed to go outside everyday, but as time passed this caution was neglected. Opinions regarding radioactivity varies from person to person, both in the adult world and the children world’s. There were families who worried about the radioactivity and those who didn’t. Even if the opinions are differed from person to person that is okay, but if someone is no longer going to get along with others became a difference in opinion. I think that is wrong, because of the radiation, I felt as if the communities’ relationship became stronger. My mother protected me from the radioactivity, even till this day. Even at school they do not teach us the truth, but I have decided to protect myself since I became sick. I had a nosebleed and diarrhea all the time. Because of this, my mother sent me to my grandmother’s home to live. My grandmother lives in Fukushima Prefecture, however, her place is safer to live because of the lower concentration of radiation. I made many friends at the new place. Every day seemed to be a happy day, but we didn’t talk about the radiation at all, but one day, I told my friend that I was exposed to radiation when I was 11 years old. Then I felt that she didn’t understand what I was talking about and that our friendship began to estranged. Since then I decided not to talk about radiation to my friends. I see her occasionally, but I don’t talk to them about it at all. Even though people say the level of radiation is low in my grandmother’s place, she still lives in Fukushima. So we made up my mind to move out from Fukushima Prefecture. We went to Hyogo Prefecture for the long holiday. I have some friends there, so we decided to live in Hyogo Prefecture. I go to Democratic school now. This is why I felt that public education didn’t suit my style of education. I’m very happy now. I’m satisfied how each day goes.This is what I have experienced so far but I’m still experiencing new things. It is fact that I’m from Fukushima Prefecture, but sometimes I feel ashamed of this. Sometimes I think what I would do, if someone says “Don’t go close to her because she was exposed to radiation”. Why do I have to feel this uneasiness? Why does the government not doing anything to help? Even if the government does something, this isn’t put into action. It is very sad. Because I feel, as if the actions of the government had been properly put into action, I wouldn’t feel as if I have been thrown out from my own country. After the earthquake my mother and father divorced, because their opinions differed about the radiation. I felt as if my family was broken. I felt extremely emotionally and mentally weak.I never want anyone to feel this kind of sadness again. This is why I talked about my experience today, so that you could understand what is going on in Japan now. My experience is only one out of many thousands, but please don’t forget my story because it reflects a part of our reality. Hello, everyone. 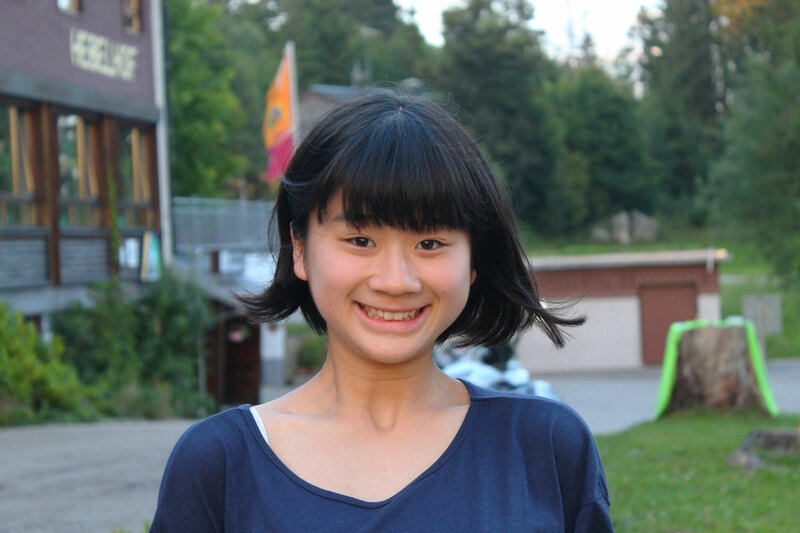 My name is Hinako Mafune, and I am 16 years old. My hobby is watching movies. My favourite musician is Japanese band of “supercar ” maybe nobody knows. And I like eating and sleeping. So in Germany I want to enjoy delicious German food, eat heartily, and sleep happily with a full stomach. I come from Sukagawa-City in Fukushima prefecture, but now I live in Matsumoto-City in Nagano prefecture. It is 300 km away from the Daiichi nuclear power plant. Let me tell you about the state of evacuees from Fukushima in Matsumoto-City and in the entire Nagano prefecture. I was a third-grader at an elementary school and lived in Sukagawa-City in Fukushima prefecture. It is located about 60 km from the Daiichi nuclear power plant. I was in the classroom, and everyone was standing at their desks to do a formal greeting to end the day. Suddenly, the classroom began to shake violently. I was very surprised and could not move. I went under my desk by the voice of my teacher. First, l felt exciting because it’s like an attraction at an amusement park. But l gradually became terrified. I hoped “stop it, stop it.” When the earthquake subsided, we went out from the school building to the school ground, and waited for families to come to school. Shortly after, my mother came to pick me up. I felt safe but my mother had a stern expression on her face. I heard that our house hadn’t had much damages. I thought life would go on as normal, and I felt relieved. However, three days later on March 14th, there was an accident at the Daiichi nuclear power plant. By watching the picture of the accident on TV, even as a child, I felt that it was a serious problem. The next day, my mother said, “Hey Hinako, let’s go”. I felt happy. Because l thought l could go shopping with my mother. I left my hometown with my mother and we went to Nagoya city and then moved to Eniwa city . These cities are 100s km away from Fukushima. And we evacuated there for about three years. At the time, I was very confused, even though my mother decided to move to protect me from radioactive substances. Our lives as voluntary evacuees were challenging. The situation gradually became worse mentally and financially. Before entering junior high school, I remember discussing many times with my mother whether we could return to Fukushima, or continue our evacuation life. However, it seemed that neither I nor my mother had the energy to continue. One day, my mother had told me about a new project named, “Matsumoto Kodomo Ryugaku”. This is the project for Fukushima children, who lives in together in dormitory . We are living a part from our own family. But the project members support us very well. Then my mother said to me. “Hey, Hinako, your body is precious. Because you haven’t been exposed almost. So if you go back to Fukushima and be exposed, l will feel sad”. What my mother said made my decision to live a part from my family. But My life in Matsumoto was so hard. So I called my mother many times. I said “l want to go back to Fukushima.” But my mother only nodded, and never said “if you want, you can go back”. I noticed she was so sad, too. Gradually, my life became good, now go to a high school in Matsumoto-City from the house. I thank my mother so much. Someday, I want to help out children who might be exposed to radiation, not only for families living in Fukushima, but also for those living in east parts of Japan. In our dormitory, we are accepting some children from Fukushima and its neighbour prefectures. I think it is important for those participants to spend time feeling refreshed, and not worry about risks of exposure to radioactive substances. I felt that it is important to continue such activities. Therefore, I want to help out with such projects in the future. Mafune Hinako (4th. 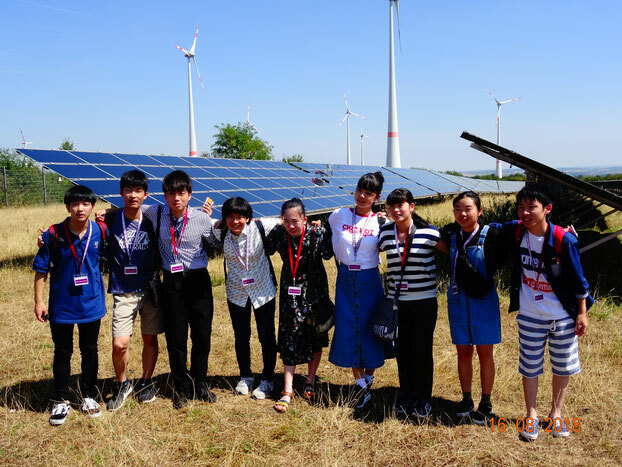 from left) and her friends from NPO EarthWalkers in August 2018 on study tour in Germany ("Telling about Fukushima, studying renewable energy" 福島を伝え、再生エネを学ぶ). Visiting juwi company in Wörrstadt near Mainz. At the time of the 2011 Tôhoku earthquake, I was staying at my friend's house. It was the last day of the third semester. I had finished the third grade at that day. As I was watching TV with my friend and my sister, the ground began to shake. My friend and my sister ran under the table quickly. I took friend’s brother’s hand and hid under the table, too. I could see the situation from a gap in the table. My mother opened the window. Her fishbowl fell. The bowl and the fish inside bounced around on the floor. The ground was shaking for a long time. Everyone’s face looked so scared. I couldn't understand what was happening to me. It felt like something out of a story. I couldn't believe it was real, and this made me tremble. My house was in ruins. The wall had many cracks. Picture frames and decorations were scattered. Everything had fallen over. My favorite books, the picture I took with my family, my note books and textbooks. Everything was broken. A lot of fish died on my books. Little fish, big fish, all of them died. I thought to myself is this actually my house? Is this my room? Did we live here? I couldn’t believe it. And I couldn't understand the situation yet. For a while, my family and I had to stay in my grandmother’s house. My grandmother’s house still had electricity and water, so we could see what was on TV. The phone rang many times. We hid under the table every time there were aftershocks. On the news program, the newscaster was talking with a tense face. They were playing videos of what happened, and that was the first time I saw a video of the tsunami. Many houses, towns, and harbors were swallowed by the tsunami. Everything was destroyed. Everything disappeared. Memories and lives were stolen. In the videos, people were crying and shouting. ”Please return my hometown to me!”, “my house is being washed away!”, “Where is my son!”, “Hurry up! We must escape to a high place!”. The newscaster told us how many people died during this disaster. And that’s when I understood the situation. A lot of people died and the town was destroyed. A terrible thing had happened. I felt a deep fear inside my heart. I cried. I thought “I don’t want to die. I want to live”. I faced death at only nine years old. I didn't know a lot about radiation, but I thought it was like a dangerous poison. I thought that even if I put just a little bit in my body, it would kill me. We couldn't drink water because it was polluted by radiation. After a long time, I returned to my house. I cleaned my room. I buried dead fish in the ground. The books that got wet from the fish are still being stored today. I can't say when the great east Japan earthquake exactly finished. I actually don’t think it’s over even now. Many people still can't live in their hometown, and agriculture is still suffering from its damaged reputation. We can't forget this happened. I still can't watch videos of the earthquake and tsunami without breaking down in tears. This incident left a big wound in us. I’ll never forget it. Neither will the other people who experienced this tragedy. I think victims have a duty to tell many people about their experiences in order to protect peace in the future and not let the memory of this event fade. I believe this is our role. Please don't forget this happened. Please don't forget us. And please share this problem with many people. I think this is a powerful way to protect the lives of many people and help prevent further tragedy from future earthquakes. The first day back at school after the event, my classmates and I had to make some promises. First, we wouldn’t play in the schoolyard. Second, we would put masks on when going outside. Third, we would wear long-sleeved clothing outside. We kept those promises for a while, but after just one year passed, they were forgotten. Our lives were almost back to normal. One day for a field trip, I visited a harbour in Fukushima. I was shocked as I emerged from the bus. There were almost no houses or buildings. The high ground was neat and flat, but there were still only a few houses there. It seemed like nobody had moved back into their homes here. Certainly, it would be difficult for people to return, especially for young people who are afraid of the radiation. I felt tears come to my eyes as she shared her story. That must have been so difficult for her. But now she is looking toward the future. I thought I must do the same. Radiation took a huge toll on us. More cases of thyroid cancer in children and young people had been found recently, and many people still can't return to their hometown. Sometime People call us “Dirty”. When people hear the name “Fukushima” they make a sour face. When I search Fukushima on the internet, I see “Fukushima is dirty. Fukushima is dangerous. Fukushima is terrible.” I want to ask the people who wrote these things “What do you know about Fukushima? Did you see Fukushima with your own eyes?” I can't say what is the truth, and I think everyone doesn't know the truth. Nobody can predict the future. Maybe more number of people or I could have thyroid cancer. Or maybe radiation couldn't decrease. And in the future, maybe more tragedies could happen. But please don't discriminate against us. Please don't call us “Dirty”. Because we are recovering. Many people not only from Fukushima are trying their best to make better Fukushima. They are struggling against radiation. Please don't see only bad point of us. Please see the truth of us. I want you to say one thing - please lend your hand for us. I believe we can make a great future of Fukushima. We can make it. And young people must do it. So please visit Fukushima and see it with your own eyes. Please think with me what we can do to help. Let's make a better Fukushima together.